I was cleaning out my desk preparing for a move downstairs (doesn’t sound too positive does it, but we are turning my office into a conference room) and I saw a disk for ArcVoyager. Bet some of you might remember that name, I sure had forgotten about it though. Take a look at this great screen shot that ESRI has on the ArcVoyager page (I’m still amazed at how many MS Windows 3.11 screen shots ESRI has still posted on their website and marketing materials). Anyway, does ESRI still support this program? I mean even though the web page does say, “ArcVoyager was built so that little support would be necessary.” I’m guessing that at some level ESRI is still pushing ArcVoyager. Of course finding this ArcVoyager disk isn’t as cool as the PC ARC/INFO floppy disk that reader Mapperz emailed me. 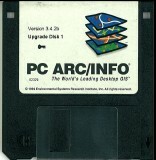 I have a PC ARC/INFO 3.5.1 CD-ROM disk that I haven’t used in years, but that doesn’t beat 3.5” floppy PC ARC/INFO.